Type: Perennial thistle with edible fleshy bracts. Grown as an annual in the northern two-thirds of the state. Planting Method: Divisions or seed. Start plants indoors in the winter and set out when all danger of frost is gone. Harvest Time: Cut the buds when they are small, fist-sized, and still tight. Stems should be soft several inches below the bud. Growth Habits: Grows easily in warm to hot weather. It can stand only a few degrees below freezing. Shoots die to the ground and rot after one year’s growth. It grows back from off shoots. Culture: In cold climate (most of Texas), the root can be dug, stored inside, and kept cool and dry. Brush away the soil and store in burlap bags. Suckers and roots can be potted and held over winter indoors. Protect from cold weather after they are planted in the garden. Prepare the soil with rock minerals and lots of manure compost. Spray regularly with fish emulsion or Garrett Juice. Excellent drainage is needed, but artichoke need plenty of moisture. After the last harvest, cut the stems off at or below the soil surface. Troubles & Solutions: Possible pests include snails, slugs, caterpillars, and several diseases. Control insects with trichogramma wasps, beneficial nematodes and citrus oil sprays if necessary. Harvest and Storage: Cut buds when the size of a small fist by cutting 2 inches below the bottom of the bud. Eat while fresh. 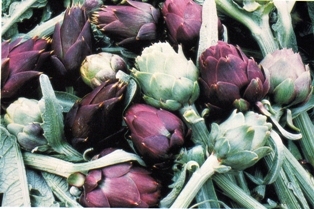 Notes: Artichokes can be a helpful source of nectar for beneficial insects and can be used as an ornamental background plant.